Much of what Danielle Wepener makes is beyond her control. Things just happen, often as a consequence of feeling disappointed about the progress of a work. 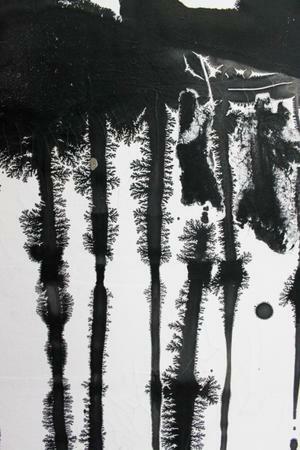 In The Lift (2011), for example, Wepener deliberately spilt paint over a painting she didn’t like. “It was the first work I’d painted after a nine week break,” she explains. “And the Swedish girls kept coming into my studio and telling me my paintings were crap.” As much as it was an act of covering up, a petulant disavowal of her own labour, and response to the stress of an impending crit session, it was also a deliberate fracturing of her process. The canvas was left face down for the weekend, the paint bonding it to the studio floor. On the Monday morning Wepener, with assistance, lifted the canvas, tearing between the paint that remained on the floor and on the canvas itself. The resulting surface prompted a conversation that not only made her keep the canvas, but also leave it largely untouched. In the tradition of all those brushless paintings that have defined aspects of modernism, Wepener has consistently toyed with different forms of mark making. In Through Destabilisation (2011), she poured a layer of white PVA onto the canvas before squirting black ink over the wet paint. The process resulted in a tentative expression of action and reaction, where forms of seepage blurred the artist’s original gestures. Not surprisingly surface is an important element in Wepener’s work. But the base, the layers and the final surface hold equal weight. “I try not to be too precious about the surface at any given point,” explain the artist. “It’s important to risk an area of a canvas, and risk it again and again, until you understand that the work holds itself and speaks for itself.” This risking is as much reductive as additive. Throwing thinners and water onto the canvas at the same time, and seeing what happens. Adding a layer of white paint, and seeing how it sits on the surface after a few days. The reduction is an archaeological scratching at these layers. “What’s great about the aesthetic of this process is that I can scrape away at the surface or remove a layer as I like,” says Wepener. Her process started out as a means of averting the fear of getting lost in the empty canvas and her early efforts were a reaction to the untouched canvas. But in extending her mark making beyond the conventions of horse hair, and especially in leaving materials to their own gravitational mediation of the canvas, Wepener’s process has ventured into the choreographic. It is not so much the performance of a Jackson Pollock – and anyway, she shies away from his overbearing shadow in favour of a curiosity for the processes of Cy Twombly – as the orchestration of the movement of liquid forms. It is the choreographic form that implicates and foregrounds Wepener’s own actions in the work itself. And then there is a second iteration of the choreographic in the viewing of Wepener’s paintings. This viewing reflects the two types of paintings that she has produced for this exhibition. The first is named ‘Typographies of Thinking’ and the second is called ‘Spatial Paintings’. Where the former are designed to be viewed more conventionally in a gallery setting, the latter are installed in spaces outside the gallery form. On the other hand, the ‘Spatial Paintings’ demand a more direct physical engagement, even altercation, and originated with a realisation of the limitations of the white cube. “At the end of last year I became dissatisfied with only hanging paintings in a clean gallery,” she offers. So in some of her work she turned to deliberately constructing a relationship between what is on the surface of the canvas and where the canvas is installed (rather than hung). Not surprisingly, Wepener refers to these paintings as ‘architectural’. The installation itself is choreographic in its conscious manipulation of the movement of people through a space. It is directed at shifting walking into new forms of meaning, and changing ways of looking, as a result of the placement of canvases. The diorama is an often beguiling combination of three-dimensional forms set against a two-dimensional painted background. The trickery of the diorama form gives the viewer just enough three-dimensional ‘reality’ and two-dimensional drama to momentarily suspend disbelief. Wepener’s work, and especially her ‘Spatial Paintings’, are dioramic in their occupation of a transitional space between the two- dimensionality of the canvas and the three-dimensionality of the foyer space in which they are situated. There is a sense of recognition and misrecognition in the paintings, destabilizing any definite sense of contextualization and creating a dizzying sense of movement between being drawn forward and pushed back, often at the same time. And all the time, moments of seduction and desirability that keep the viewer coming back for more.